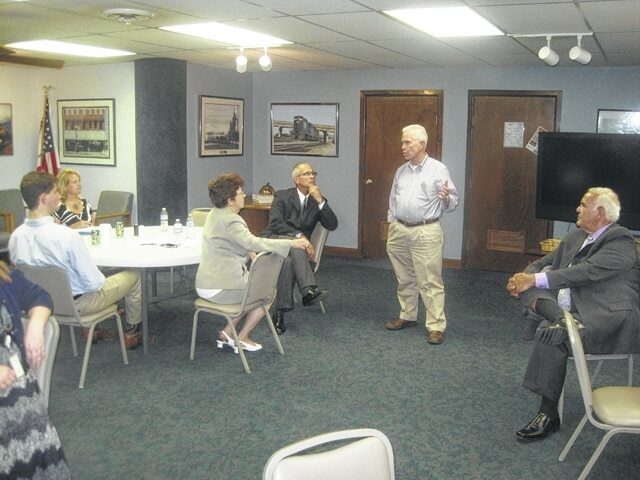 Photo by Frank Lewis | Daily Times U.S. Rep. Bill Johnson addresses economic development issues at Community Action Organization of Scioto County. If your company has looked for employees, or you are someone who has sought employment and/or training in Scioto County, chances are at some point that process may have flown through the OhioMeansJobs Center located at the Community Action Organization of Scioto County. It is a one-stop center that helps employers and potential employees find jobs and training. On Wednesday, U.S. Representative Bill Johnson (R-OH) visited the center to see first-hand the unique operation. Johnson talked exclusively with the Daily Times following the meeting. Rosie Picklesimer, Workforce Development Area Number One director, explained the role of the Workforce Investment Board. She said the dollars are available for career services for things such as on the job training, incumbent worker training, and more. “All of the employment training programs operated by Community Action Organization flow through the OhioMeansJobs Center,” Luanne Valentine, OhioMeansJobs Director, said. Johnson said one of the roadblocks for businesses in America’s regulatory system.